Chris is a Stanford-educated tutor with over 10 years experience tutoring Trigonometry to students of all abilities, from students struggling to get from a C to a B, to go-getters trying to move an A- up to an A, to struggling students just hoping to pass. In that time he got a lot of experience learning how to explain this stuff in a way it actually makes sense to normal people. Through his videos he has helped countless students, and he can do the same for you. 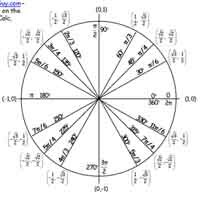 Click the thumbnail below to download a pdf of the Unit Circle for your trig class, in both radians and degrees. 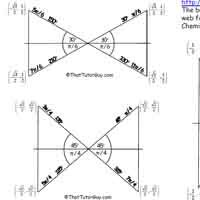 Also shown is the "bowtie angles" chart, which is a dumb name but really gets the point across: each angle on the unit circle has three buddies which have the same reference angle, so the sooner you recognize these virtual bowties the sooner you'll master the unit circle (and the sooner you can quit talking about bowties like some kind of dorky Bond villain). These are those problems where you've got sines and cosines inside of each other. Like you'll take "the inverse cosine of the sine of pi/3" or "the tangent of the inverse cotangent of 1". Very complicated looking, but if you work from inside out you can do these all day long.